A new University grant program that combines scholarship with campus sustainability is offering up to $50,000 in funding for projects that promote reductions in greenhouse emissions and increase awareness about sustainability. 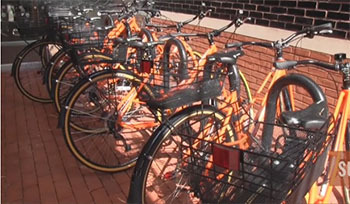 The Syracuse University Climate Action Plan, which was released in 2009, is providing the competitive funding to students and faculty for projects in the spring semester. The deadline for submitting proposals is Dec. 31. The grants are part of the Campus as a Laboratory for Sustainability program, overseen by a team of faculty from 11 schools and colleges. The project merges academic scholarship with the University’s broad initiatives to meet energy efficiency goals, while having the campus become a testbed for innovative ideas. As energy efficiency efforts have been implemented in recent years through the University’s Climate Action Plan, some of the savings have gone into a fund that is expected to grow so that similar or increased grant funding will be available in future years. Syracuse University’s Climate Action Plan, CAP, is expected to completely eliminate the University’s net emissions of greenhouse gases by Dec. 31, 2040. Actual emissions will be reduced by at least 65,000 metric tons as a result of projects that focus on energy conservation, energy efficiency, creation of energy from renewables sources and changes in the behavior of students, faculty and staff. The initial call for proposals seeks a broad range of ideas. Individuals and groups of students or faculty may apply for as little as $500 or as much as $50,000. Proposals may address any of a range of sustainability issues in addition to energy use, such as environmental justice or solid waste reduction, as long as the proposal addresses the relationship between the project and climate disruption. All projects must also include outreach or educational activities that promote campuswide awareness of sustainability issues. The projects can include faculty or student research, applied research, campus infrastructure or landscape projects, outreach campaigns, service projects or course development. Download the Call for Proposals at http://sustainability.syr.edu/vision/campus-as-laboratory-for-sustainability/cfp-cals/. The deadline is Dec. 31. Proposals will be reviewed by the faculty team, and final decisions will be made by the chief facilities officer and the vice president for sustainability initiatives.